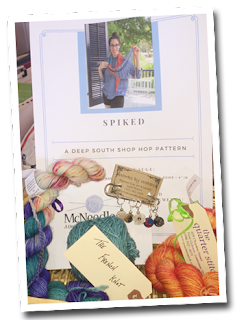 Be sure to join us during the month of June for the 2018 Annual Deep South Shop Hop. McNeedles, The French Knot and The Quarter Stitch are offering special yarns to make the Spiked Shawl. The pattern is free with the purchase of the yarns. Our shop has teamed with Lorie Waters, a local artist, who created unique, hand-made stitch markers especially for the event. Make sure to get your passport stamped at each shop and turn it in to be eligible for great prizes.